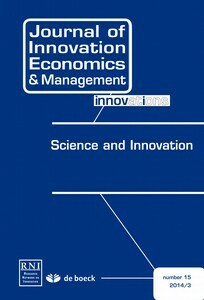 Le papier « Market maturity, patent renewals and the pace of innovation: The case of wind power in Germany » de Marc Baudry et Béatrice Dumont est publié dans Journal of Innovation Economics and Management. Our paper aims at exploring the link between market maturity and patent renewal decisions in the wind power sector. We use micro-level data on patent legal status and patent metrics from the Patstat database, as well as data on installed capacities. We estimate a micro-level model of renewal decisions that control for both patent metrics and market maturity. Our results show that renewal decisions are sensitive to market maturity. More specifically, market maturity positively affects the initial rent but increases the depreciation of the rent.